Late November. I climbed Mt. Takamiyama (1,248m, ‘Kansai’s Matterhorn’) on the border between Nara and Mie. 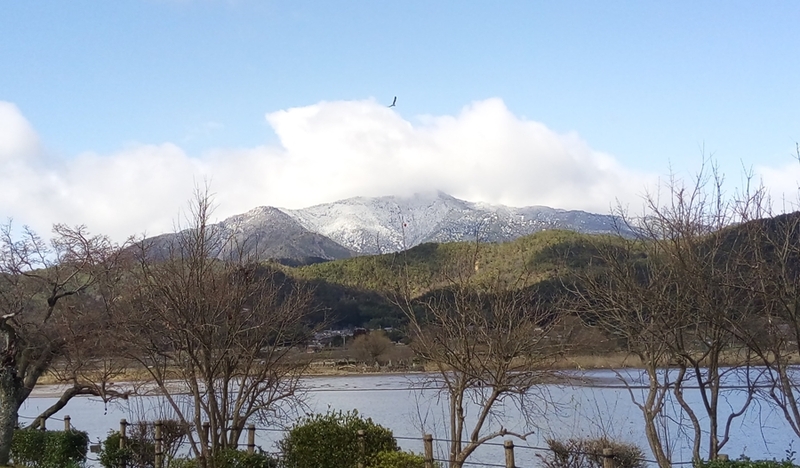 Found a little snow at the top, where there’s a shrine to Yatagarasu, the giant three-legged crow, guide of the first emperor, emblem of Kumano Jinja (and of Japan’s national football team). The scene was almost biblical: a mountain ark. 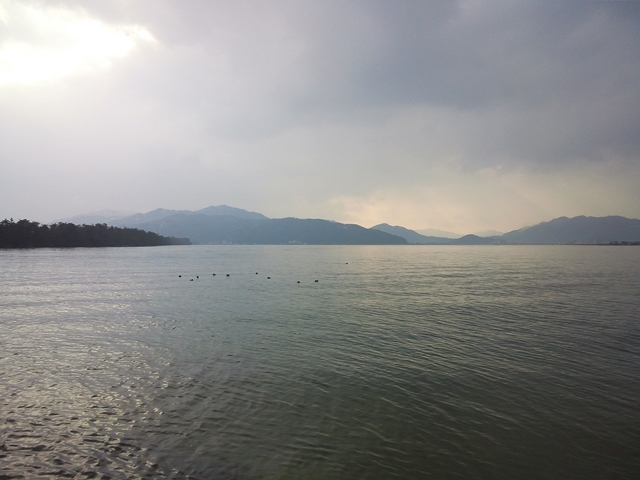 After the descent, took a dip at Takasumi Hot Spring. Of this, another time. 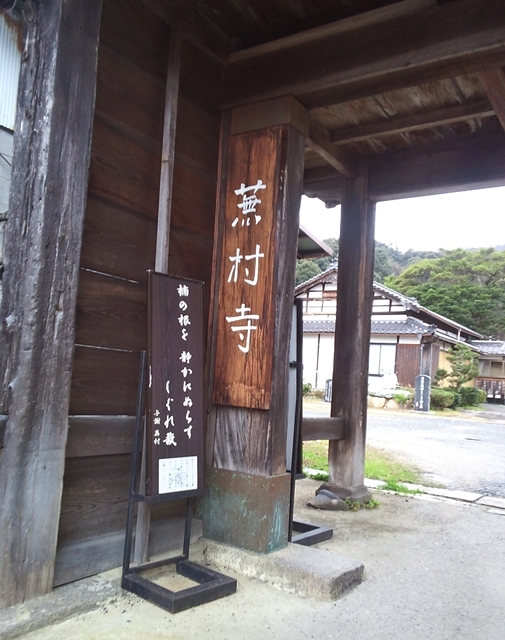 The bathhouse receptionist gave me a map, however, on which was marked “Sekitei-an”, a haiku poet’s hermitage elsewhere in the village of Higashi Yoshino. I remembered the name from Blyth’s History of Haiku. 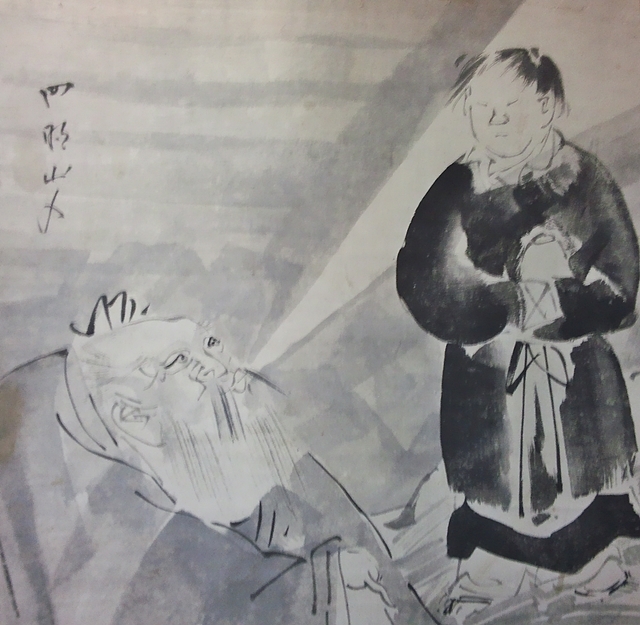 Although Blyth has him in Meiji, he is actually one of the best of the Taisho period haiku poets. I began to envisage a Hailstone event there next year. 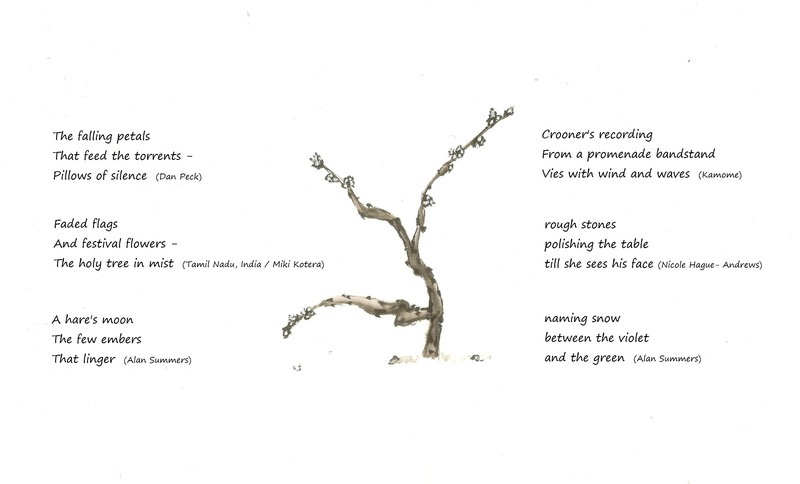 In the meantime, here are two of his beautifully alliterative/assonant verses for the winter season. Happy New Year! Prior to Sunday February 12th, Kyoto had seen intermittent snow for two days and nights, much of the city having been shrouded in white. 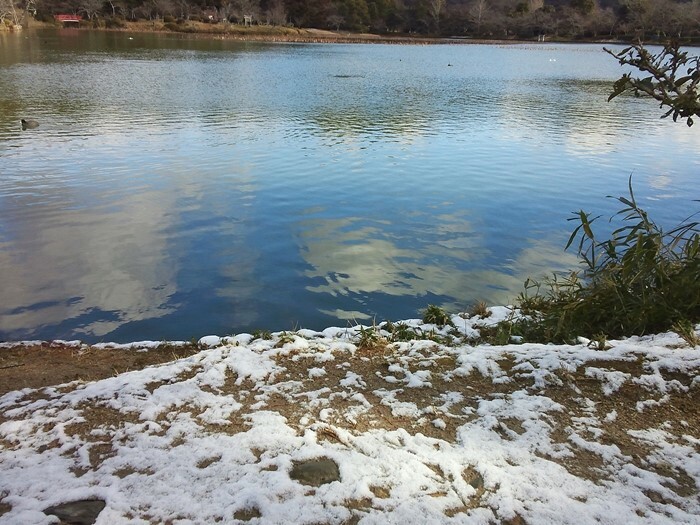 A poetic adventure invariably on his mind, it didn’t take long for Tito to come up with an idea for a snow-viewing meet at two famous ponds in Saga. In spite of very short notice, six haiku wanderers showed up on what turned out to be a mostly dry and breezy Sunday. The snowfall, alas, had petered out by the early morning hours. All we were left with was white mountain-tops and an occasional patch of unmelted snow to marvel at along the way. 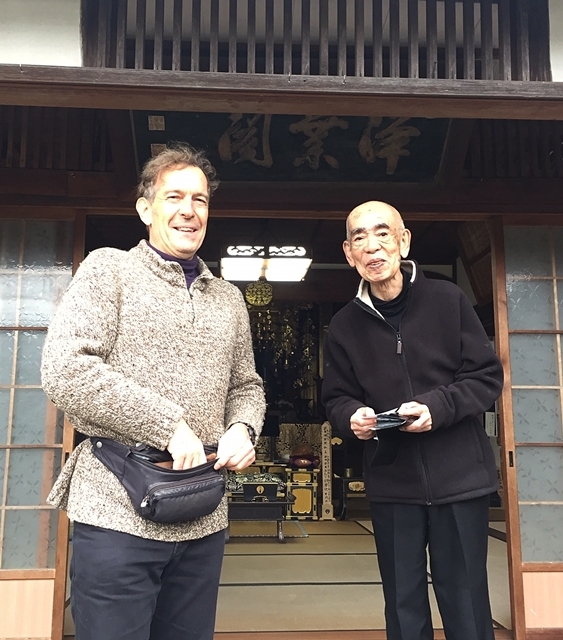 Four of us started our walk at Daikaku-ji in Ukyo ward, where a small shrine dedicated to Sugawara Michizane (Tenjin-san), the Japanese God of Poetry, sits on an island in Osawa Pond. 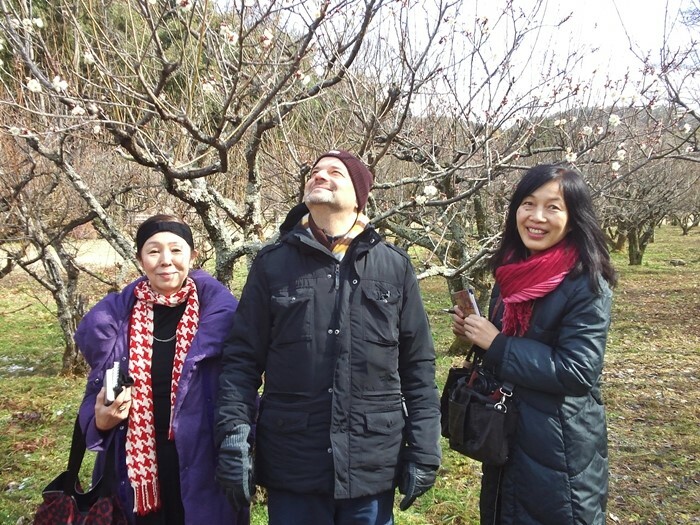 Nearby, a plum orchard, barely in bloom, was a welcome sight. Years ago, Tito used to live just around the corner from Daikaku-ji and, needless to say, knows the surrounding area like the back of his hand. He was kind enough to provide us with lots of information on local history, both ancient and recent. One such point of interest was a group of burial mounds (‘Kitasaga Shichi Kofun’) dotting the rural landscape of vegetable plots and rice-fields. After clawing our way to the top of one such tumulus, we were astonished to find a great number of badger burrows, some of them freshly dug. 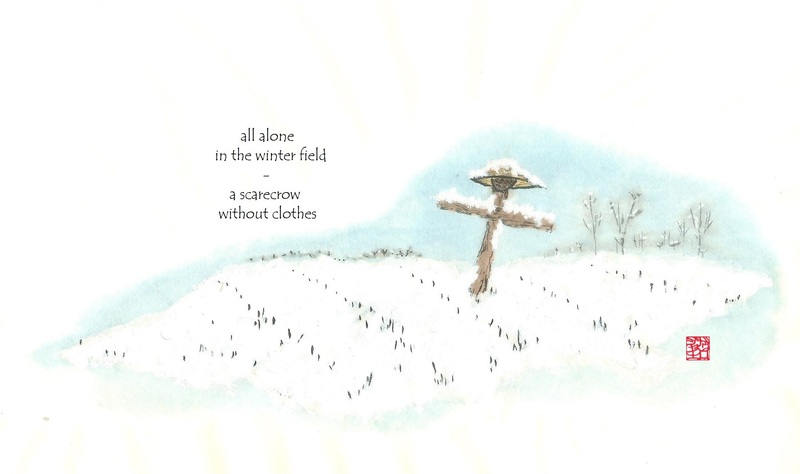 From each emanated a strong animal scent, and it was safe to say the nocturnal creatures were better off inside the mound than we were, standing frozen on its windy top. 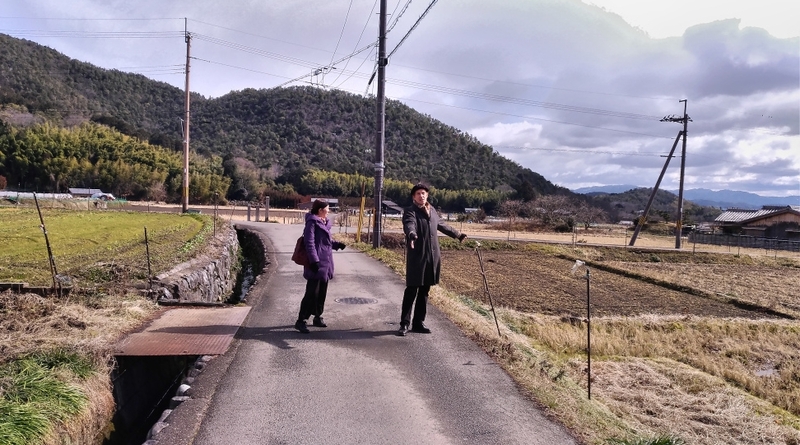 More plodding through the fields, soggy with snow-melt, and the four who began at Daikaku-ji eventually reached Hirosawa Pond … for a perfectly timed rendezvous with Hitomi and Duro (Gerald). This pond is emptied every December and was that day still partly water-less, a landscape dotted with wading birds foraging across the shallows and mudflats. Our final stop was a rather stylish Japanese restaurant, a 15-minute walk from Hirosawa Pond. Have you ever dined at a place frequented by members of royal families? Well, apparently this was such a place! On the walls, large photos recorded visits from the Cambodian and Burmese Royal Families, those of Mongolian dignitaries, and even one from a Ugandan chieftain. 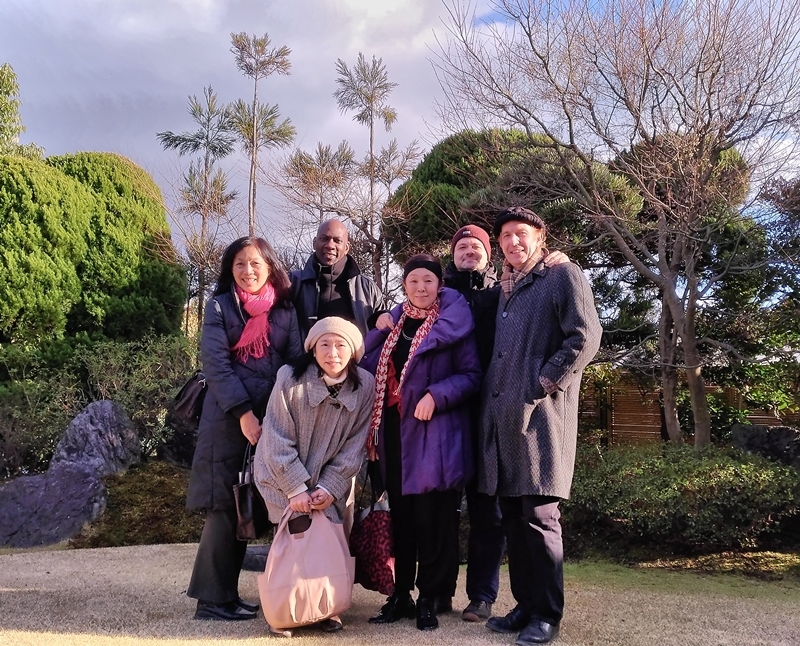 After a lengthy meal and a productive and fun haiku sharing, we had a group photo taken in the garden outside. No sooner had we said goodbye, than snow began to fall again! * Everyone is welcome to submit a haiku to the Icebox whenever they wish by leaving them as a comment (via reply box) either under this post or on the new Submissions 5 page (see link at top right of our top page, reached by clicking anywhere on the top I C E B O X photo). Please feel free to comment below on this selection. Some of the haiku are very open to interpretation!